Insects are always fun, but they are not always this fun! This project guides you through “entomology” basics like insect types and parts, how to catch insects, and why they are so important to us. Make your own collection of 30 insects! 2018. Beginning level. State fair eligible. Follow the link and click on the audio button. Dig a little deeper into the world of insects by learning to love a caterpillar, recognizing relatives of insects, building a new trap, and identifying friendly predators. There’s more too! Your collection at this level is 40 insect specimens. 2018. Intermediate level. State fair eligible. These activities take you to expert level as you dissect a grasshopper (yes, you read that right), explore insect history, investigate trapping, and welcome “beneficials.” Anyone want a room in the bee hotel? Finish with your own collection of 50 insect specimens. 2018. Advanced level. State fair eligible. Coming soon! This site has pages of articles written especially for 4-H members. The section called How to Preserve Insects covers pinning large insects, pointing smaller ones, and storing ones with soft-bodies in liquid. Be sure to check out the How to Pin a Ground Beetle video. Insect Hunter Jason Thomas has a YouTube channel with fun and informative videos. 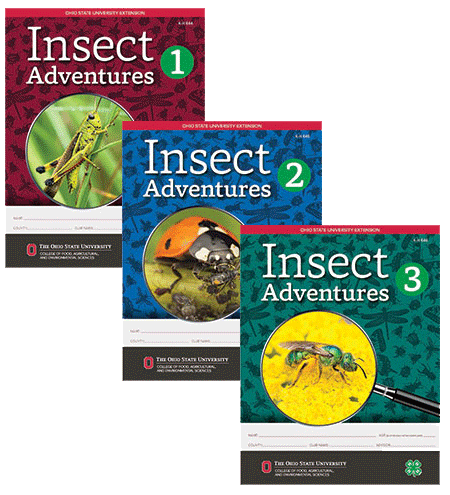 Start with Intro to Insect Collecting Basics for Kids (Episode 1), and then keep your eyes open for links to episodes 2 through 5. Don't know what "pinning" and "pointing" are all about? Watch the two videos at A Guide to Mounting Insects on Pins for short, easy-to-follow explanations of both. Silvia Rondon gives careful and specific instructions on Pinning Butterflies and Moths, Pinning Large Insects, and Pinning Small Insects. This list of necessary insect collecting equipment includes all the basics for a smooth and expert start. We've included the catalog number for supplier, BioQuip, but other suppliers like Carolina Biological Supply Co. and NASCO are good too. Prices may vary slighty from those listed below. Just for Fun. Are you a Buckeye fan? Visit the Department of Entomology at The Ohio State University website for a video of Termite Script Ohio.